I'm becoming quite obsessed with cochineal. For those who have no idea what that is – no worries, neither did I a few months ago (beyond it being a red food colouring). It's an insect, as well as being the name of the dye colour they produce. The insect feeds off a certain cactus and releases carminic acid to deter predators. While the dye on its own produces a rich blue-red, when mixed with an acid or alkali it can produce one third of the colour spectrum – from golden yellow to the deepest purples. 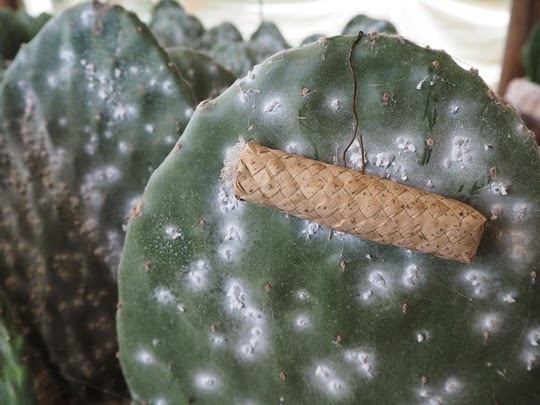 Oaxaca is the centre of cochineal production in Mexico and was once responsible for the second highest grossing export for the country behind silver. 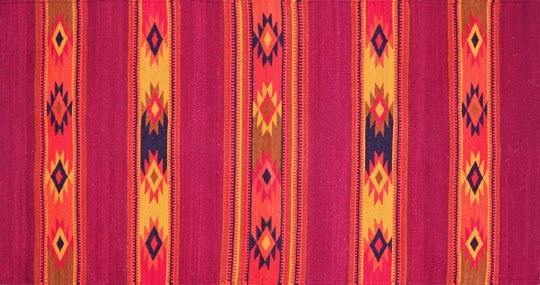 In fact, during colonial times, the Spanish forced a monopoly on cochineal production. If you were caught smuggling it the penalty was death. 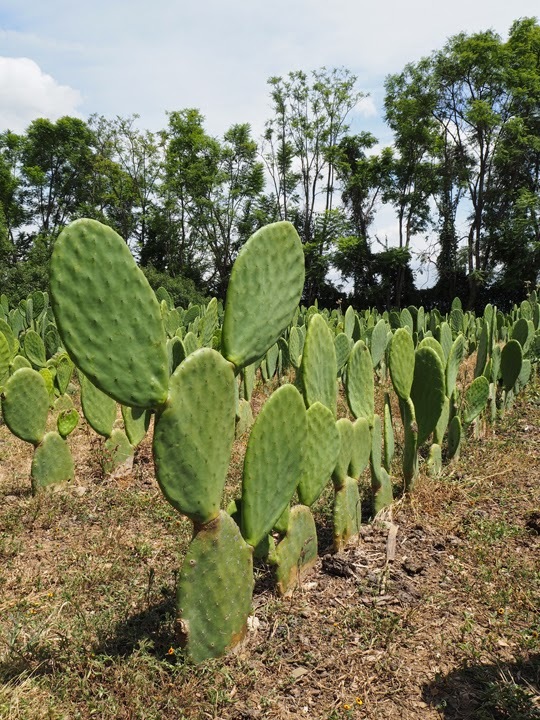 While farming cochineal lessened dramatically following the introduction of synthetic dyes, the move to sustainability, and issues with allergies to synthetic food colouring has seen a resurgence in its production. 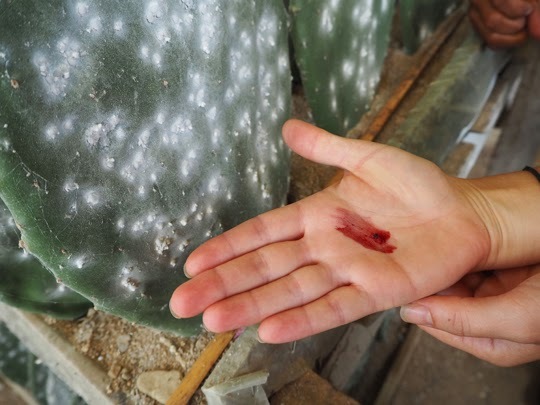 So, given we are in the cradle of cochineal and are all interested in its use as a textile dye, we took ourselves off to a cochineal farm to see how it all works. The tour of the farm was completely in Spanish, so I've filled any gaps with Wikipedia. That little cylindrical basket in the photo above is called a zapotec basket, and it's used in the controlled method of cochineal farming. 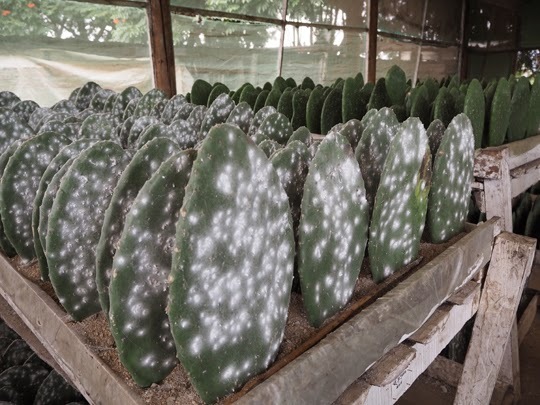 The big leaf shapes are removed from the cactus and brought into a greenhouse (for want of a better term) because they need to be kept at a certain temperature. The baskets contain the fertile females, who leave to feed off the host cacti, waiting to be fertilised. The white you can see all over the cacti is the new baby cochineals that can be harvested when they are 90 days old. They need to be manually brushed from the leaves and then dried and processed – it's pretty labour intensive. To use it as a dye you need to crush the dried cochineal and mix it with water as well as a mordant to fix the dye. It takes an enormous number of insects to produce a kilo of dye, somewhere in the order of 80,000–100,000. It's been very hard for us to buy plain-spun yarn or cotton that is dyed with natural substances, it seems most weavers dye it themselves or buy synthetic-dyed materials. It's a bit of a shame as it means we can't use natural-dyed thread while we're here. Below is the cochineal farmer's dye recipe chart. It's important to keep records like this if you want to achieve consistent colour each time. Last, but not least, this is the rug I bought on a tour we did. I will write about the tour next, as it was a really wonderful experience, but I wanted to show the rug here as it's completely dyed with cochineal – amazing isn't it? This blog is a mine of information. You're sure on a steep learning curve, Tara. I think the class prep I've been able to do helped massively, plus we're immersed in textiles all day every day so it doesn't feel overwhelming. Tara what a beautiful post, thank you for sharing. It's been a dream of mine to visit Oaxaca and tour the cochineal farms. 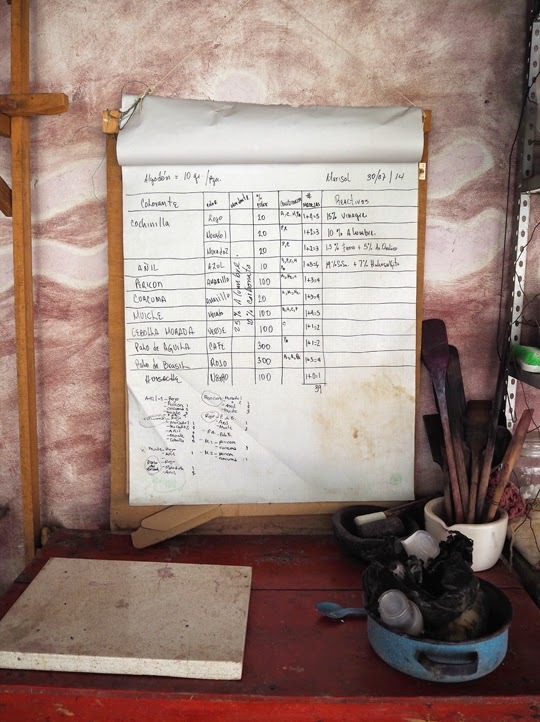 I'm fascinated by the farmers dye recipe chart, would love to see a close up of that a get a better understanding of their process. Also so they sell the Zapotec nests in the market there? Thanks so much Maura. I'll send you the pic so you can have it in higher resolution. I can't say I've seen the baskets in the marketplaces, but I'll keep an eye out from now on!